Fourteen independent stores in North Oxford are joining forces this Easter with an ‘Indie Easter Trail’, led by Fair Trade shop Exclusive Roots. The Trail is designed to encourage local families and visitors to discover the area and its retailers. Jericho has always been an animated hub of the city, offering itself as a thriving unique shopping destination. But in the current economic climate, independent retailers are facing harder times. This Easter, Exclusive Roots on the Woodstock Road has rallied other like minded North Oxford shops into taking part in the nationwide Indie Easter campaign starting on the 23rd March and running through until the 14th April. The trail is a fun, free and exciting way to entertain the children in the school holidays or simply discover what is on offer on your doorstep. 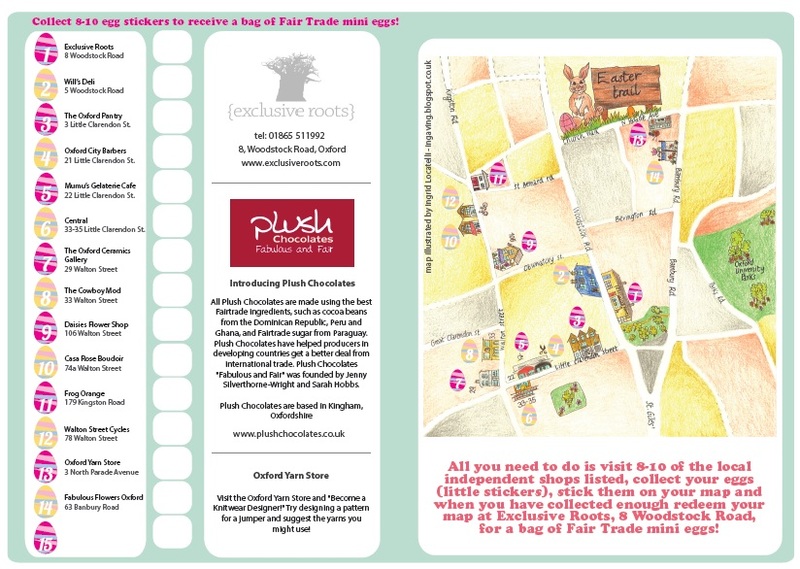 All you need to do is collect a map from any of the participating retailers and visit a selection (8-10) of the shops on the trail, collect your eggs (little stickers) on your map and when you’ve collected enough eggs redeem your map at Exclusive Roots where you will receive a bag of Plush Fairtrade mini eggs and a certificate of completion! Supporting your local traders has a real positive impact on the local economy, with every £1 spent with a local, independent business between 50p-70p circulates back into the local economy. With more consumers now opting to shop online or out of town, local businesses are feeling the squeeze. This may save customers time but with every £1 spent in this way only 5p trickles back into the local economy. When consumers shop with their local independents ‘ they are doing their bit to keep their high street, town or village centre open for business’. Sadly, it really is a case of ‘use it or lose it’. “Now really is the time to stop and think before heading to your large supermarket or out of town shopping centre for that kitchen appliance, photo frame, bunch of flowers or birthday gift. Look at what is on offer to you just a short stroll away, you’ll more than likely be pleasantly surprised and find just what you are looking for and more. Shopping locally is so important to keep our towns alive, not just for the economy’s sake but for social interaction, community spirit, happiness and most vitally jobs.” Holly Dutton, Business Development Manager, Exclusive Roots. Of the fourteen shops taking part in the Easter Trail, there are some oldies and newbie’s on the block. Walton Street Cycles first opened their doors in 1975 and are one of Oxford’s oldest independent bike shops. Daisies’ Flower Shop has been trading since 1987 and Cowboy Mod & Son also on Walton Street have been going strong since 1995. The newest to the area is Oxford Yarn Store, having opened on South Parade in December 2012 to the delight of local knitters, crocheters and fine yarn enthusiasts. Exclusive Roots, the activation partner for Oxford has taken its role in this campaign very seriously, as the trading arm of UK registered charity Tabeisa, they know only too well how important it is to work together as a community. Since 1994 they have supported over 2,000 small businesses in poor Sub – Saharan African communities. Joining forces has never been more important for local Independent Retailers, Oxford, make this Easter an independent one! This entry was posted on Wednesday, April 3rd, 2013 at 12:19 pm and is filed under Uncategorized. You can follow any responses to this entry through the RSS 2.0 feed. You can leave a response, or trackback from your own site.